Tony won three Munster and three All-Ireland medals. He also won six league medals with Tipperary and two in the American series against New York. The parish of Lorrha became the “Kingdom of Tony”. Tony was born in Mullagh Co. Galway in 1919 and played both Junior and Senior with Galway. In 1946 he played full forward with Galway in the Monaghan Cup game at London against Tipperary. Tony scored a point anf Galway lost by a narrow margin. Later that year Tony was sub-goalie on the Galway team that went down to Cork in the All- Ireland semi-final at Birr. In February 1947 Tony came to Lorrha, his reputation as a goalkeeper had preceeded him and he got his first opportunity to show his prowess when Fr. O’Meara went to him in Holy Week and asked him to play on Easter Sunday. St. Vincent’s of Dublin were coming to Rathcabbin to play Lorrha in a challenge game. This was his first match in Tipperary, the first of many successes. In 1948 Lorrha won the North Final after 21 years. Tony Reddin became a famous in this final against Borrisileigh on August 22nd. Lorrha lead 4-3 to 0-4 in the first half. Borrisileigh attacked with everything in the second half. All goals attempts were stopped with mechaniocal ease by Tony Reddin. Lorrha scored a further 1-1 and the praises were sung of a new goal keeping star. He was a very fit man and many people recall Reddin as a big man going high for the ball, catching it securely and bursting out amid a mass of hurls to cleaer well up the field. This proven ability won him his place on the county team. His first game with Tipperary was against Offaly in Birr. He played the delayed 1947/48 league final against Cork on October 31st, Tipperary lost but the “splendid goalkeeping of Reddin” was the redeeming feature of the game. Many of the following games saw Tony’s brilliance being regaled in print. The league final was held on February 27th and it was Tony’s first outing at Croke Park and the day he won his first medal for Tipperary. Reddin’s first championship match with Tipperary was against Cork at Limerick on May 29th 1949. Tony was 30 years old, many sports people would be retiring, however it was to be the start of the most brilliant chapter in his career. The game was a draw and the replay was a month later it was described as “the roughest and toughest exhibition of unclean hurling that has been seen for many a long day”. It was another draw and extra time was played and Tipperary won by two points. Tony Reddin picked up a knee injury at the end of the first half but was persuaded to carry on. John Doyle made his debut for Tipperary and completed the last line of defence which was to be solid phalanx for a number of years. In 1956 Tony played some of the finest hurling of his career, winning his second North medal against Borrisileigh 4 – 8 to 0 -18. Tony played in the league against Galway on October 14th but wasn’t tested. Tipperary won the league in May 1957 with Blackie Keane in goal. It was Tony’s sixth league medal and won him a trip to New York the following October. He played one game in the US and this was his last match with Tipperary. 1957 was the last year that Tony appeared in a hurling jersey. Tony married Maura Smyth of Lelagh, Rathcabbin and lived at the pike Rathcabbin farming, making hurleys and providing a hackney service. In 1960 he got a job with Bord Na Mona. In 1963 he moved to Banagher and lived on Cuba Street. 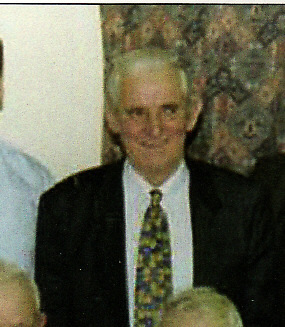 Tony offered his services to St. Rynagh’s club with whom he had great success winning eight county finals.